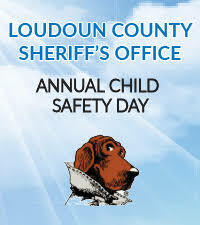 The Village at Leesburg will hold the sixth annual Child Safety Day from noon to 4 p.m. Saturday, Aug. 12. The Loudoun County Sheriff’s Office is holding the event in partnership with the Leesburg Police Department and the Drug Enforcement Administration. The free event will include LCSO vehicles, the K-9 unit, a dive truck and boat. Exhibiting agencies include the LCSO, LPD, DEA, the Office of the Loudoun Commonwealth’s Attorney, Loudoun County Child Advocacy Center, Loudoun Abused Women’s Shelter, Loudoun Child Protective Services, Loudoun County Fire and Rescue, the FBI, Inova Pediatrics and the National Center for Missing and Exploited Children. Many of the displays will be aimed at providing information to parents on how to protect their child from becoming a victim of a crime. Children are invited to “lend a hand in fighting crime” by dipping their hands in non-toxic, washable paint and placing their handprints on a sheriff’s office car. The event will also include live entertainment, a moon bounce and games. Loudoun Sheriff Michael Chapman will also present the fourth Loudoun County Sheriff’s Office Leadership Award during the event. The award honors members of the Loudoun community who display outstanding leadership and make valuable contributions to improve the lives of others. The award will be presented at 1 p.m., and will be followed by a raffle for adults and children.